Discussion in 'Tank Journals' started by Eugene, Jan 20, 2018. 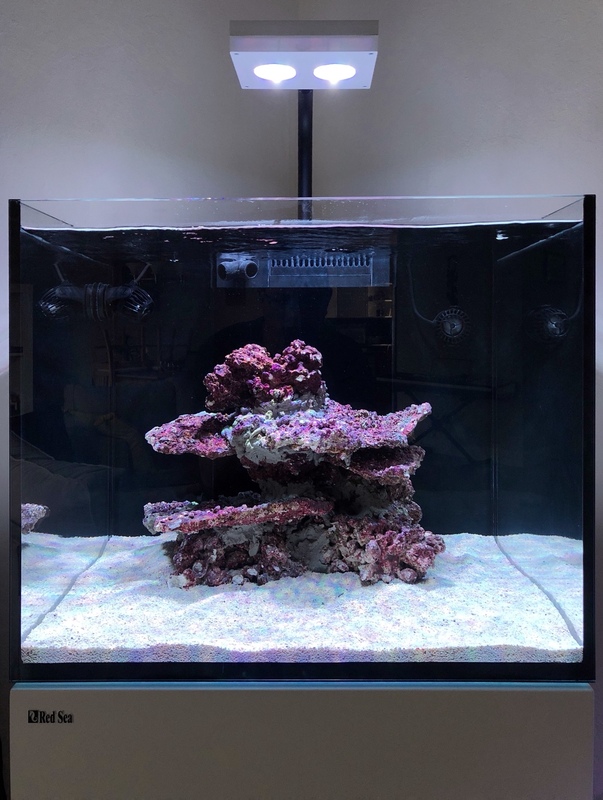 After long lurking I finally pulled the trigger and re-started my tank. First step is done - livestock homed in the rubbermaid container, and tank sat with acid water for couple days. Looks really clean now - couple more water refills and will start cycle! I have a question to you guys - my tank sits on the tile second floor - really easy to clean, doesn't leave stains etc. However all noises from the tank got amplified and sound really loud underneath. Any ideas what to put under the stand to isolate noise? Always exciting starting a new tank . Do you know what equipment is making the noise? Is it the overflow? Is it the skimmer? Is it the return pump? Different acoustic sources will have different techniques to reduce noise. Placing padding under the stand may not always be the best option. Dont have direct experience but couple of these may help? If sources of noise are inside stand, I’d try put the dampening pads between sump and stand. Dc pump and skimmer create a lot less noise. Gablami and Eugene like this. The stand has all kinds of isolation - there are rubber under sump, tank, on the side of the sump. Stand sits on the tiny silicon pads, but might be not enough. The equipment is very quite - you can't hear anything staying next to the tank. It's just a floor by itself - I can hear cat walking on the first floor and the tank is right above my bed. I think it's simply lack of sounds-proof under the tiles. And since I will have empty tank there is chance to put some sound-proofing under it. Thanks! I'm also excited to try fresh start! Hmm, I drove around looked for sound proofing and the only thing I found is home depot flooring underlayment, but it’s sold in 100sq rolls only. Definitely too much for my needs! There are also something called “acoustic insulation sound board”- not sure if it will work with tank sitting on top of it. I’ve used the acoustic sound board (not for your application though). I wouldn’t use it. It’s very porous and a bit delicate. I would think that it would breakdown and disintegrate over time with that kind of weight (not to mention if it got wet). I decided to put cork liner, it did reduced noise, much better now. Time for another wash! Kmooresf and Chromis like this. iCon and kinetic like this. Same here! That is a huge failure waiting to happen. @Eugene I might have missed it, but why isn't the bin on the ground? because he wants to prove how strong those chairs are. Daredevil! Living life on the edge. @Eugene where did you find sheets of cork liner? Seems like a good idea for new builds. I have found almost exact size - 48x24 in ACE Hardware. There are also thicker 12x12 tiles. I fold it and glued two layers together. I also saw some in Michael's.